Medicine, in terms of both disease pattern and therapeutic practices, shows tremendous geographical variation. Data and recommendations from different socioeconomic settings may not correctly reflect picture at home. 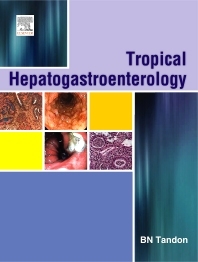 There is no existing book devoted to the discipline of tropical hepatogastroenterology from India and this book fulfills this need. It emphasizes on medical management of hepatic and gastric diseases relevant to the tropics. The strength of this book is greater focus on practical management of gastrointestinal diseases in the tropics. It is edited by Dr BN Tandon, who is regarded as the Father of Tropical Gastroenterology in India. The book is divided into ten parts: esophagus, stomach, small bowel, large bowel, liver, liver failure, gallbladder and biliary tract, pancreas, pancreatic diseases, and special topics. Each chapter extensively reviews epidemiology, etiopathogenesis, clinical features, diagnosis, medical treatment, and surgical treatment. Chapters written by more than 50 leading authorities who have worked extensively with the tropical conditions that they have written about. Focuses on clinical aspects of diseases important to the tropics. Addresses digestive diseases as a discipline rather than as a medical or surgical specialty. Provides management of specific clinical situations that are encountered in developing countries.